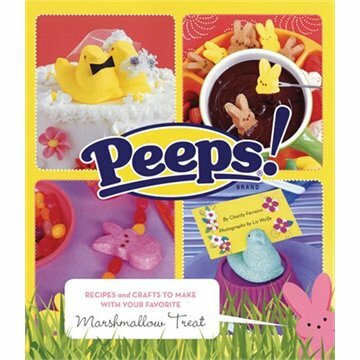 What It Is: If you’re a Pinterest fan, you’ll no doubt have seen a few ingenious uses for everyone’s favourite sparkly sugarcoated Easter marshmallows (I personally enjoy / have made Peeps S’mores), but this little book takes things a step further. Mixing recipes and crafts, it features two dozen ways to repurpose your chicks and bunnies to celebrate the season. Make an Easter wreath for the front door or indulge in a chocolately marshmallow fondue! Who It’s For: Your wife, to tuck into an Easter basket of her own. Your mom, to do activities with her grandkids on Easter Sunday. Your brother, so he and his buddies can film their gastronomic Peeps adventures for their YouTube channel. What It Costs: List price is $16.50, online price is around the $12 mark. Where It’s At: Booksellers nationwide, including Indigo. Lookin’ for an Ezensa bonus entry? Tell me who you’d gift this sweet book to. Actually…. I would keep this one for myself! I was on Pinterest last night looking for easy recipes to fill some goodie bags for nieces and nephews and half the recipes featured Peeps! So this book would be a keeper. My sister-in-law would love this book because she has several grandchildren. My mom, she loves Peeps! My granddaughter would love this book and with the help of her mom, make some creative peep-art. I would love this book for myself. I’m always looking for creative ideas that involve being in the kitchen. I’d give this to my sister-in-law, who gives Martha Stewart a run for her money. I’d keep this to use with my nieces and granddaughter! Looks like fun. Ezensa bonus entry: I’d gift this sweet book to my sweet friend who is always there for her niece & nephew. She’s a great cook/baker & all around sweetie. I would gift this to my daughter who love to make goodies! !